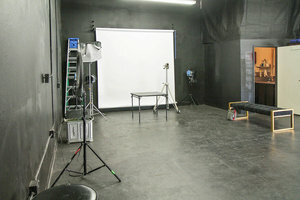 The studio boasts a large open stage space for photo shoots, film shoots, art instillations, music video shoots and more. 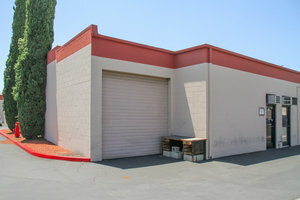 Located in Glendale, close to Burbank, Hollywood and Los Angeles. Built for creatives, this studio has dozens of seamless paper backdrop available for photo sessions. The professional studio includes a lighted vanity make-up area to perfect the hair and makeup of your models. Clothing rack and steamer allow for your wardrobe stylist to tailor the right looks for your model. Filmmakers are able to build sets in this studio. A huge loading gate allows for easy filming. 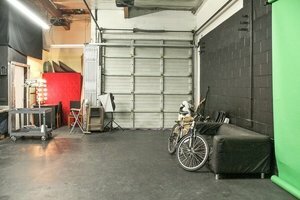 Actors have a separate dressing space and the studio comes with folding tables for craft service catering areas. It makes a great filming locations for music video, fashion shoots, photography shoot, video shoots, commercial filming, documentary interviews and so much more!